As a general rule of thumb it’s pretty safe to say that the earphones that come bundled with most mp3 players are universally awful. The best thing you can do with bundled earphones is leave them in the box or dump them in the bin. Even moderately priced aftermarket earphones will usually offer a significant improvement in sound quality over whatever came with your player or mobile phone. 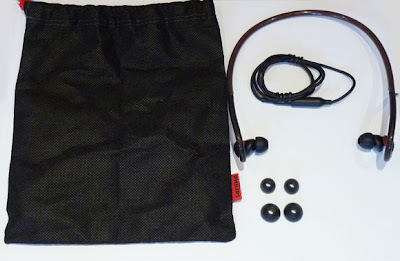 However, although I’m generally all about the sound quality when it comes to earphones, if you’re planning to do most of your listening while you’re exercising, there are other factors to consider besides pure fidelity. Obviously I still want decent sound quality when I’m out running in the park (not on the road) or in the gym, but I’m willing to trade sound quality (to a degree at least) for earphones that can withstand the punishment inherent with sports usage. Factors like fit and comfort are vital when you’re using earphones during sporting activities, while the ability to function when literally soaked with sweat is also pretty important. As such, many earphone manufacturers have created models specifically aimed at active users with the concerns mentioned above. One such manufacturer is Philips and its ActionFit Neckband Headset is aimed squarely at active consumers who want the best audio experience while exercising. Inside the box you’ll find the ActionFit SHQ4017 headset itself, you also get a cable extension, three pairs of silicone tips (small, medium and large), a carry case and a shirt clip. The headset has a 60cm cable, which includes the in-line remote. This makes the headset ideal for use with an arm mounted mp3 player or phone, where a longer cable can cause annoying tangling and slap. If you want to carry your player in your pocket or backpack, the extension cable adds another 60cm of length.The shirt clip can also help stop the cable from flapping about too much, but if you tend to run your headphone cable underneath your running shirt, you can remove the clip. Although I generally prefer foam tips for in-ear ‘phones, the silicone tips supplied by Philips provide a comfortable fit with a good seal. Noise isolation is impressive too, so you won’t have to pump up the volume too high to cut out ambient noise or annoying piped music in the gym. The neckband is designed to run up and over your ears, with the cable exiting the band far enough away from the earphones to ensure no tangling. The best part about the neckband though, is that there’s no pull on your ears regardless of how active you’re being. The cable feels strong enough to withstand regular use and the trials of being rolled up and shoved into the carry case. It also seems to be reasonably resistant to tangling. With traditional in-ear solutions when you remove the earphones you’re left having to hold them or stuff them into your pocket. However, with the Philips neckband headset, you can remove the earphones and leave them hanging around your neck like traditional headphones. This is particularly useful when you’re getting ready for a run. The earphones themselves sit comfortably in your ears with the neckband taking all the weight and ensuring that they don’t pull loose. The earphones are also sweat-proof, so it doesn’t matter how sweaty your ears get during a run. The seal also managed to remain intact regardless of sweat levels. There is a degree of cable slap when running, which is mainly due to the in-line remote and the plug/socket when the extension cable is employed. That said, if you run the cable under your shirt, the cable slap is all but eliminated. Just remember that it’s harder to use the hands-free functionality with the cable under your shirt. Assuming you’re using a compatible iPod or iPhone, you can control the volume and start/stop/skip tracks via the in-line remote. This is particularly useful when running, since you don’t want to have to dig your player out of your pocket every time you need to skip a track. If you’re using an iPhone, you can also use the in-line remote to answer a call. The microphone built into the remote then allows for hand-free chatting, with the call coming through on the headphones. Personally I don’t want to accept calls while I’m running or in the gym, but I guess if you’re expecting an important call, it’s a feature worth taking advantage of. It’s also worth noting that if you’re using the ActionFit headset in the gym, anything that requires you to lay on your back can be an issue. Because the neckband protrudes from your neck, when you lay your head back the headset is pushed forward – not enough to unseat the earphones, but it does make things slightly less comfortable. 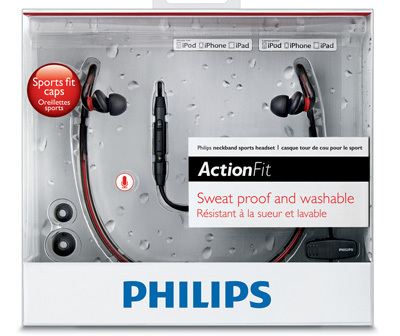 Like many earphones targeted at active users, the Philips ActionFit headset favours strong bass over high-end clarity. At first I found the sound a bit muddy and muffled, especially when compared to my Shure SE530s or even my Klipsch Image X10s. But after a few running sessions the sound started to grow on me, with the slightly heavy bass providing the kind of thumping soundtrack that encourages training. As such, the Philips ActionFit headset isn’t particularly well suited to more mellow acoustic fare, but that doesn’t tend to be the kind of music I listen to when I’m training. 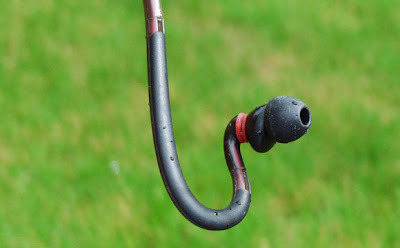 Throw something with a heavy bass line or some rock at the ActionFit headset though, and it does a pretty good job of getting the blood pumping and the feet pounding.Groove Armarda’s My Friend came through loud and clear, with the heavy beats thumping through my head as I pounded the grass. Surprisingly, the subtle background snare wasn’t lost, it just isn’t quite as easily discernible as it would be on earphones designed purely with sound quality in mind. Changing tack completely I skipped to Times Like These by Foo Fighters and again the Philips ActionFit headset gave a pretty decent performance. There’s still a bias towards the low frequencies, but there’s enough clarity to keep things enjoyable. Obviously that lack of high-end clarity becomes more of an issue if you’re planning to use the ActionFit headset as your everyday earphones, even when you’re not training. If you’re just sitting and listening to music you might find the bass bias a bit distracting, especially when listening to acoustic or even classical music. 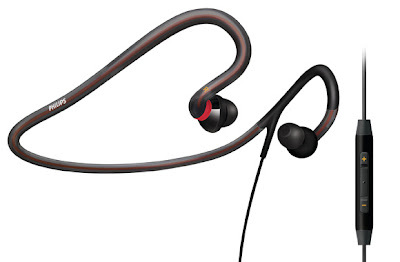 The Philips ActionFit neckband headset makes a good case for itself if you’re a keen runner or gym goer. The fit is very comfortable in the ear and the neckband removes all strain and pull from the earphones themselves. The modular cable makes it flexible enough to use with armband cases, while the in-line remote makes controlling your player while running far easier. Another major plus point is the sweat/waterproof nature of the ActionFit headset. Not only are the earphones not affected by sweat running into your ears while training, that sweat can also be washed off post run. You can just run the whole thing under the tap after your training session to make sure that it’s clean and fresh the next time you hit the gym or the park. However, if you’re looking for ultimate fidelity in the sound department, you’ll be slightly disappointed. Although the sound quality is perfectly adequate when running or training in the gym, I found it a little muddy and bass heavy for general listening pleasure. With a price of around £60 the ActionFit neckband headset isn’t exactly cheap, but you’re getting a lot for your money. The fit is comfortable, there’s no tugging at your ears when running and the earphones can be rinsed clean. If you’re looking for earphones specifically for sports usage, the ActionFit headset is definitely worth considering.